The Geirangerfjord is without doubt one of the most beautiful of the Norwegian fjords. 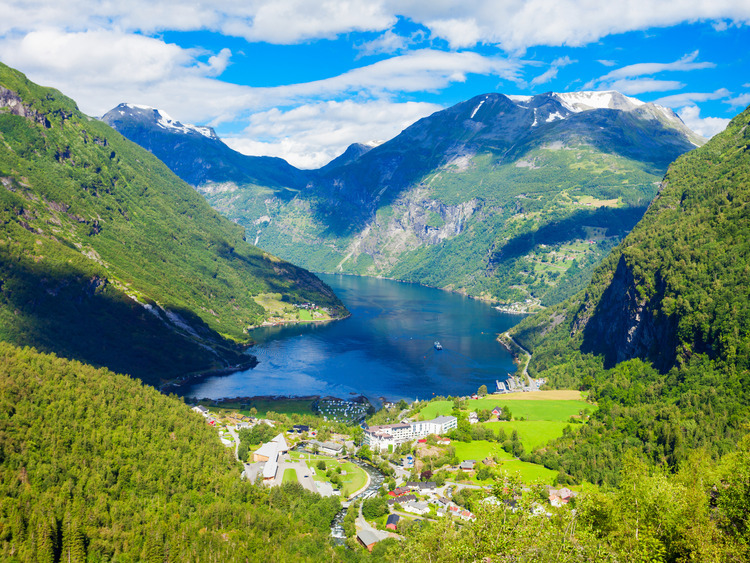 Impressive mountains, numerous waterfalls as well as farms clinging to the steep hillsides give the fjord its unique character. From the landing stage the drive goes uphill past the tiny octagonal Geiranger Church and via numerous hairpin bends up to Hole camping site where we shall start our hiking tour. The path zigzags up the mountainside through former summer pastures. In bygone days every grass-straw was made use of, even that growing in the most inaccessible places. It was gathered together and sent by means of "løypestreng" a wire leading down to the nearest barn. Our goal is the spectacular Storsæter-waterfall which falls nearly 100 ft in a wide curve away from the mountainside, thus enabling us to stand underneath the actual fall! The hike to the fall is at times somewhat steep and strenuous and takes approx. 1 hour. After having enjoyed the view we head downhill towards the farm Westerås perched on a ledge above Geiranger itself. This farm was abandoned years back because of the danger of avalanches in winter and early spring, but is in full activity during the summer months, and here we are served refreshments. After having rested and refreshed ourselves we can stay on a bit longer at Westerås farm before walking down to Hole camping site where the bus awaits to take us down to the pier in Geiranger.